With the popularity of Pokemon Go, it's no surprise that Pokemon is taking over the world once again. Every new game has brought in a new audience, but Pokemon Go hasn't just opened up the world to new fans but has drawn old ones back in too. Many of these fans are adults now and due to this, there's a new way to be social through Pokemon. Kind of amusingly there's now a Pokemon themed dating app and it's doing rather well. 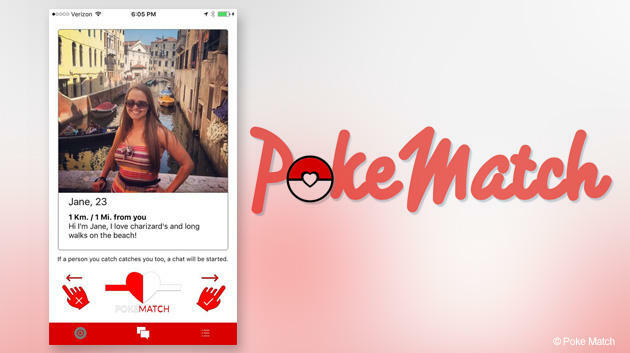 PokeMatch is a Tinder-style dating app that allows you to share your love of Pokemon to find new friends or relationships. For now, it's Pokemon Go focused, but if it doesn't want to be one of those five-minute specialised apps then they need to try to expand just as Pokemon Go needs to too. You can use just use this to find people to play Pokemon Go with and at the moment it is geared at that. Just like on Tinder, you connect the app to your Facebook account and it'll pull your name, location and profile image from that. After that, you can fill in what you're looking for, your age and a 250 character about me section. Most people will probably just say a Pokemon they love, but if you're a serious fan then I'm sure you can think of something a little less cliche then I like this Pokemon and walks on the beach. Once you're set up you swipe left on users if you dislike them and swipe right if you want to catch them. If you both swipe right, then you can message each other for a bit. This app could lead to a lot of fun and some good relationships of any sort, but only if people treat it like a social app, not just a way to get some extra tips for a game you're playing or, in some cases, not use it in a more disturbing way. The app currently has 7,500 active users and has created over 10,000 matches. A lot of them won't have actually been dates but even making a friend can lead to romance in the future if you hang out a lot.